There's a better way to market your locations. Experience the next frontier in location marketing and start telling your stories where it counts. No credit card required - simply download the Map Your City app and create your community or join one you fancy. In Map Your City, everything happens in a community. A Map Your City community is simply a group of people mapping & promoting together – like your company, organization, city or town. Copromote, cocreate foot traffic & increase sales at all your locations – that is doing smart business together! To help you tell your stories, Map Your City provides you a cloud-based Location Marketing Platform. A complete suite of applications enables you and your community to build, integrate and manage branded localized experiences for your followers & target your messaging where it counts. 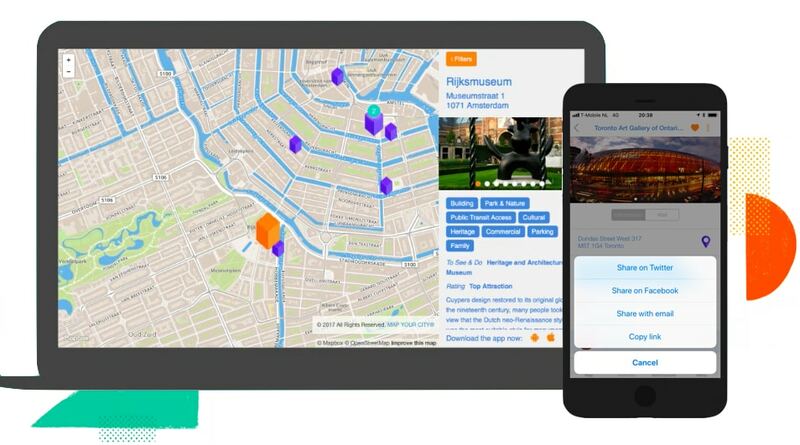 Create a community on Map Your City and work with your team, connected businesses, travel professionals or valued stakeholders to create location experiences together. Save considerable costs and improve your ROI. Join forces with a community already on Map Your City and work effectively in joint venture to increase customer loyalty & advocacy. Grow your community into a regular marketing powerhouse. Offer your visitors a seamless online experience with a customized design of your mobile app and web map, branded in accordance with your guidelines. Effortlessly integrate your customized web map and locations into – your website, all your current social media and blogposts. Create valuable (location based) experiences for your community’s followers, which can be personalized to their needs. And have them receive these experiences at a time that is convenient for them. Your organization is able to easily manage your community through an intuitive online Dashboard, including access for multiple community members and role-based permissions. Join or Create a Community and step into the driver’s seat with a clear priced monthly membership plan, giving you the flexibility you need. Or discover our enterprise solution when your community is more than 250 members, even completely customize your app with our white label option. Track your metrics and generate reports to gain valuable insights and optimize marketing, sales and service experiences. Benefit from continuous platform improvements and new features without the worry how it affects your IT. "Our vibrant music community plans a lot of concerts and event nights with bands and music lovers. Selling tickets, letting people know what's going on and where, is fast and extremely convenient." "Great platform! It allowes us to collectively build an amazing map, and gives us new ways to promote Durham Region as a great place to stay and play. Our tourism stakeholders love it"
"Map Your City is a great tool for Universities, Colleges and Startup Communities to copromote. It enables us to enrich the newcomer onbooarding experience on and off campus tremendously." "Map Your City proved extremely simple to integrate with our existing social media and blogposts for our slow food events - a big time saver that effectively increased our outreach and generated additional foot traffic!" "The Map Your City Platform is intuitive and easy to use, but should you need help there's a great team at your disposal. For our custom requests, we have felt the love and support by the MYC team - all the way from Amsterdam!" "We created a complete art experience by mapping our artists' installations throughout the city. We were able to unlock additional info through the app, connect media to the artwork, and integrate it with our online art shop - amazing." Map Your City is made with a :) by a rockstar team from Amsterdam (NL), Cebu City (PH), London (UK), Madrid (ES), Toronto and Waterloo (CA). We think the world will be a happier place when people are more closely connected to the cities or towns they live, work or play in. That is why we are on a mission to enable you to tell or experience authentic stories at the places that matter to you. ©2019 All Rights Reserved. | MAP YOUR CITY® is a Registered Trademark of ANDRS Projects Europe B.V.